What Is NFT Hydroponic Systems? Nutrient Film Technique, or NFT for short, is a very simple hydroponic method. It&apos;s basic design, makes it popular for both hydroponic gardening at home and on a commercial scale. 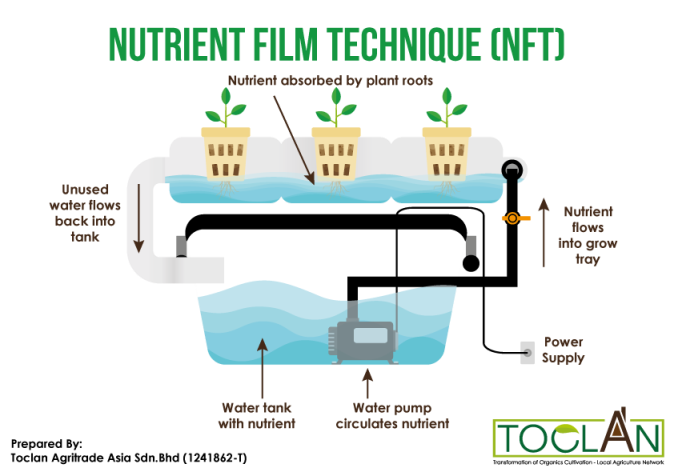 NFT hydroponic systems involves a thin layer or film of nutrient solution flowing over the roots of the plants in the system. NFT hydroponics is a great method for growing leafy green and plants with a shallow root system. Lettuce is one of the most popular plants grown using this type of hydroponic method. Along with growing lettuce, some commercial growers also grow different types of herbs and baby greens using NFT hydroponic systems. How Do NFT Hydroponic Systems Work? Though NFT hydroponics can be set up in many different ways, the systems all work on the same basic concept. Plants are placed in a shallow pipe or tube and oxygenated nutrient solution is pumped from the reservoir into the piping, which runs through the dangling plant roots. Water flows to the other end of the tube to drain back into the reservoir. Since NFT hydroponics methods cycle nutrient solution through the system 24/7, there is no need for timers. NFT hydroponic systems are dramatically affected by interruptions to the water flow. Even short periods without the system running can have a major impact on your NFT hydroponic garden and can result in a loss. What You Need To Build A NFT Hydroponic Systems?